Dr Jacky Pollack is a Senior Child Health Medical Officer with a special interest in developmental child health. Jacky graduated in medicine from the University of Sydney in 1981, and has also completed a Masters of Public Health degree at the University of NSW in 2014. She has worked for many years in the public sector in community and developmental paediatrics, and has extensive experience in the developmental assessment of preschool children and autism assessment in children of all ages. 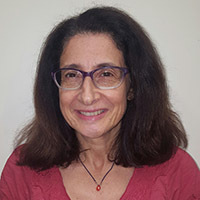 Jacky is a member of the Neurodevelopmental Behavioural Paediatric Society of Australasia and of the Faculty of Community Child Health in the Royal Australasian College of Physicians. She is a Clinical Lecturer in Community Paediatrics at the University of Sydney. Jacky particularly enjoys interacting with children during the assessment process, and is committed to working collaboratively with all the health and education professionals involved with a child and family. She is a keen clarinet player and is an active participant in a range of community bands and orchestras.